We have finally launched a defensive operation to stop the current barrage of rocket attacks from Gaza. 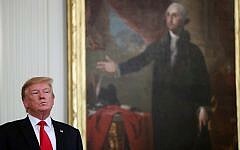 There seems to be a lot of people unaware of the background and facts and what this is all about, so to make things clear, here are ten questions and answers about the current situation. #1 – Where is the Gaza Strip? The Gaza Strip is a narrow section of land on the coast of Israel. 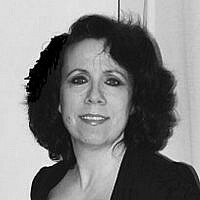 There has been a near-constant Jewish presence in that land since the Hasmonean Period (140 BCE). Control of the area was handed over to the PA in 1994 as part of the Oslo peace accords. 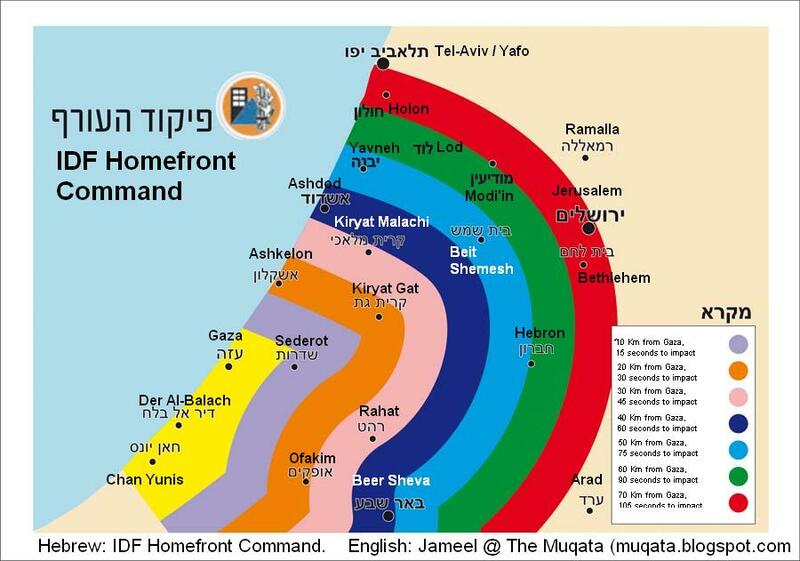 Israel handed over the entire strip except for Gush Katif to Arafat. It was after this that the security situation in Gaza deteriorated. In 2005, in efforts to separate from the Palestinians and the security concerns, Israel evacuated all of the 9,000 Jews living in 21 communities in Gaza, and handed control of the area (with the exception of the borders) to the Palestinian Authority. 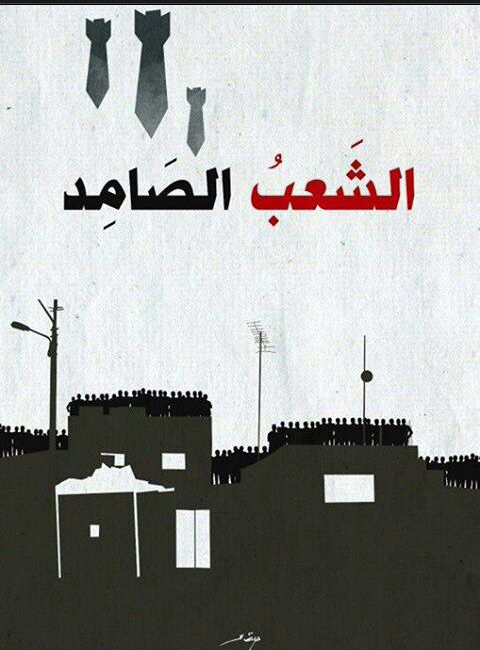 At present, 1.6 million Arabs live in the Gaza Strip. No Jews live there. #2 – So, the Palestinian Authority rules the Strip? 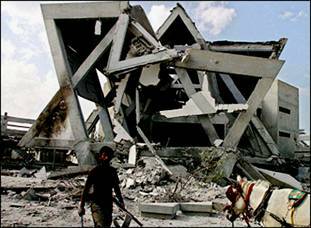 In 2007, Hamas, the terrorist organization dedicated to Israel’s destruction, took control of the area. It has radicalized the Gaza Strip and has made life for the residents (especially the Christian ones) worse. However, since the PA Unity government agreement between Fatah and Hamas, the PA is responsible for Gaza. #3- What’s the story with the rockets? If Israel and Egypt have control of the borders, how do the terrorists obtain rockets to begin with? 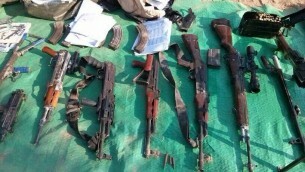 The terrorists have various types of rockets. There are 107 mm and 122 mm rockets, (Qassam) both of which have a range of about 20 km. There are also long-range rockets Katyusha, Fajr 3, Grad and Fajr 5. Most rockets are made locally using materials meant for building and improving the lives of the people of Gaza, while the longer range ones are produced by Iran or Syria. 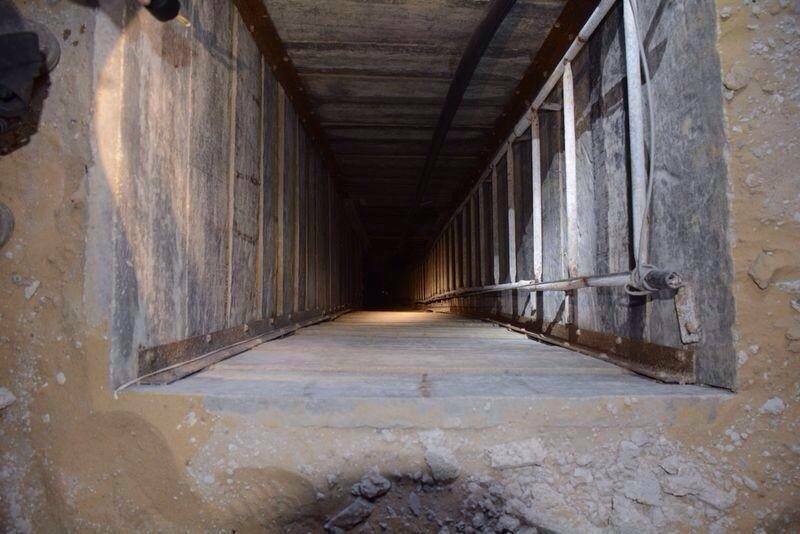 Tunnels were dug from Gaza to the Sinai and were used to smuggle weapons into Gaza. Iran also attempts to ships weapons to Hamas, via sea. Hamas has been firing rockets from Gaza into Israel since 2001. Despite the Disengagement in 2005, the number of rockets fired into Israel since then is more than 12,000. 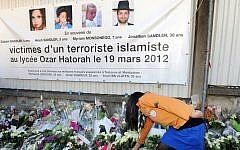 The terrorists have killed nearly 70 people, almost all of whom were civilians. They have injured thousands more. But the main effect of their rocket assaults is widespread psychological trauma and disruption of daily life for civilians. Medical studies have been conducted in Sderot, the Israeli city closest to the Gaza Strip, and document that post-traumatic stress disorder (PTSD) occurs there among young children at a rate of almost 50%. The statistics indicate that rates of depression and miscarriage are also sky high. #4- Who is under fire? 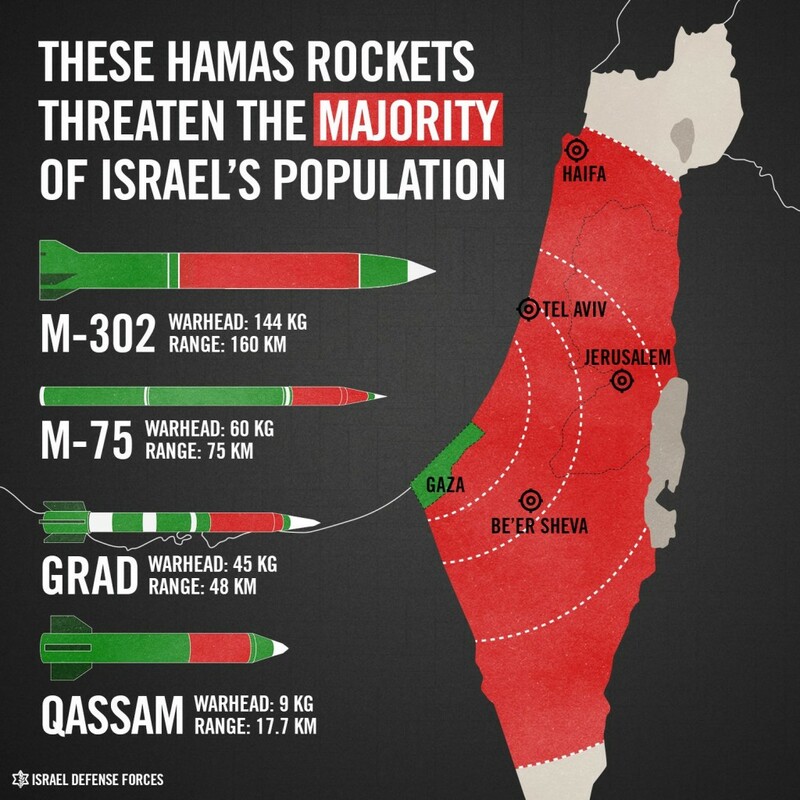 More than 3.5 million Israelis are currently within range of the rockets fired by Hamas out of Gaza. More than 3.5 million Israelis live under the threat of random rocket attacks. Those who live closest have it the worst, however. The children of Sderot know no life other than one under fire. For 14 years, they have suffered from needing to find the nearest shelter – within 15 seconds. A children’s play center was built to be completely rocket-proof so that the kids could play without fear. In the past week, the residents of Ashkelon and Ashdod have heard the sirens that warn of incoming rockets day and night, with little break. So have entire regions, populated by tens of thousands of civilians. 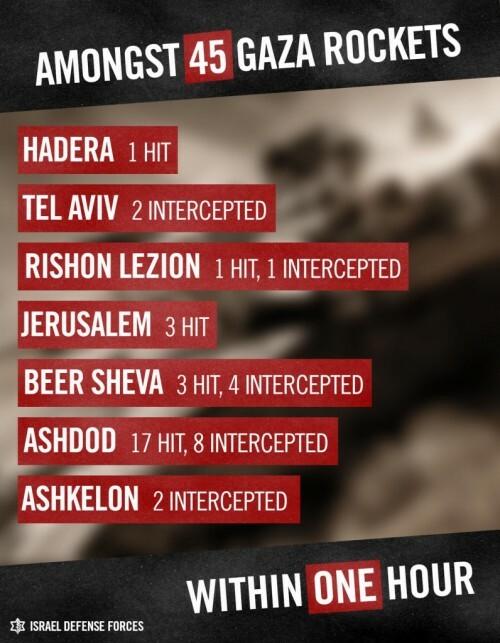 Tel Aviv, Jerusalem, Rishon L’Tzion, Gadera, Bet Shemesh and many many more cities have received multiple Code Red Alerts. Jerusalem was hit this week as were points as far as 100km from Gaza. Iron Dome technology has been implemented nearly across the country to intercept rocket fire. Update: Almost all of Israel is now within range. # 5 – What do these rockets do? 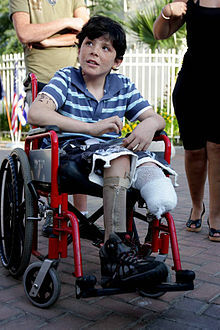 The first casualties from rocket fire were a 4-year-old boy and his grandfather, killed in 2004. Other victims include two small children, aged 2 and 4, who were killed while playing in the street later that same year, and a teenage girl, Ayala-Haya (Ella) Abukasis, who was struck and killed while shielding her younger brother. Aharon Smadga, 49, Itzik Amsalem, 24, and Mira Sharf, 26 and pregnant, were killed in a barrage of rockets that also gravely injured an 8-month-old. 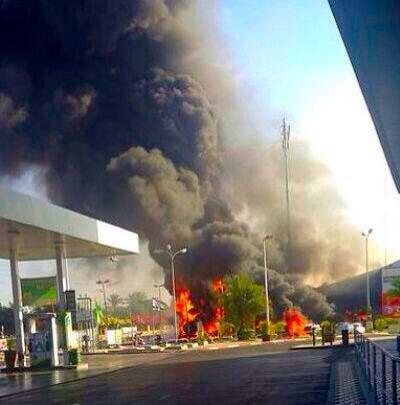 Nearly 70 Israelis have lost their lives to the rockets. In addition, more than 1,700 Israelis, most of whom are civilians, have been injured. These injuries are often grave. More than anything, these rockets inflict serious psychological damage to the Israeli population and cause the death and injury of Gazans when the IDF, despite significant restraint and efforts to avoid injury to civilians, finally retaliates. It should be noted, that some rockets have been misfired, landing within the Gaza Strip. Both children and adults have been killed in Gaza by Hamas rocket fire. Remember, no Jews live in the Gaza Strip anymore. In perhaps in the most well known case, a BBC employee’s child was killed in his home (Israel was initially blamed) in 2012. Another boy was killed around that same time while playing soccer. And recently, a few weeks ago, a 3- year-old girl was killed by a rocket that was shot from Gaza and landed in Gaza..
#6- If they are shooting so many rockets, why haven’t more Israelis been killed? Israel cares about its citizens’ safety above all else. Every public building and private home built must include a bomb shelter. Many of the older buildings have shelters in their basements, and residents are notified by Israel’s security forces as to the closest, best bomb shelter. When a rocket is launched from Gaza, the areas toward which it races are alerted and the local air raid sirens are sounded. Depending on location, citizens have as many as 15, 30, 45, 60, or 90 seconds to get to a shelter before impact. 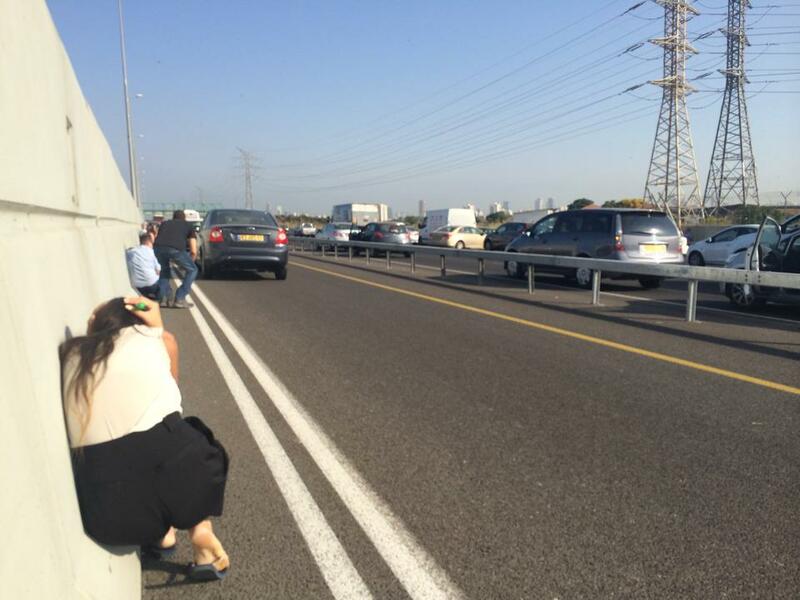 Israelis have practice drills for making their way to the nearest bomb shelter rapidly. The alerts and the practices save countless lives. In addition, when it became clear that the rocket attacks had become a constant barrage of terror out of Gaza, Israel created the Iron Dome. This incredible technology tracks the trajectory of an incoming projectile. When the rocket is expected to land in an open area, it is left alone. But when a rocket is deemed to be an imminent threat to human lives, the Iron Dome shoots a missile to intercept the rocket and explode it in the air, neutralizing the threat. The Iron Dome and the soldiers who run it have saved thousands of lives. #7- Why don’t we stop the rocket attacks to begin with? Surely, Israel has the ability to end the rocket fire. 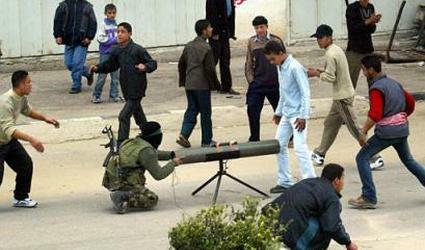 Hamas uses human shields to protect the rocket launchers. That is, knowing that Israel is reluctant to attack civilians, the terrorists purposely fire rockets from homes and schools. 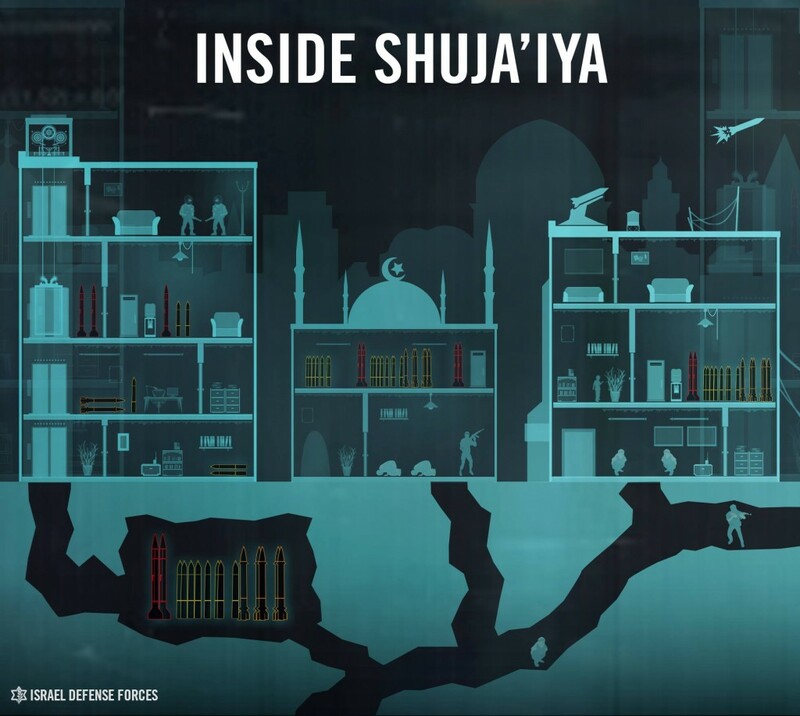 They also use residential and recreational buildings to store the weapons, making it harder for Israel to destroy the cache, without risking casualties to civilians. 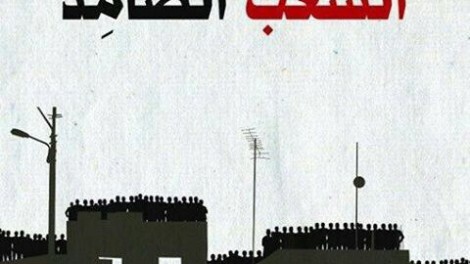 In addition, the terrorists in Gaza encourage the local residents (civilians) to stand on the rooftops of terrorists’ homes in order to deter Israeli attacks. This occurred Wednesday and after warning of an imminent strike and despite the people standing on the roof, Israel bombed the home, eliminating a senior terrorist. This is why every life lost on both sides of the border is on Hamas’ hands. Even Slate has a piece on Israeli efforts to spare civilians. #8 – What is happening now in Gaza? After waiting and calling for restraint, and being subjected to even more rocket fire instead, Israel has begun Operation Protective Edge. 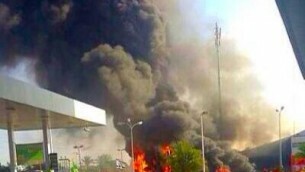 Israel is striking back by going after the leadership of Hamas. Hamas leaders have been known to hide in bunkers beneath hospitals knowing that Israel is not willing to aim at a hospital. It will not be easy to reach the heads of Hamas, but the IDF will do everything in its power to both eliminate the threat and avoid civilian casualties. 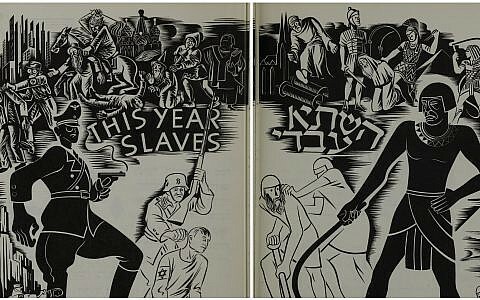 #9 – What is happening now in Israel? In the past two weeks, over 1,300 rockets have been launched at Israeli cities, including Beer Sheva, Tel Aviv, Haifa and Jerusalem. Thousands of children and their parents are sleeping in bomb shelters. Schools are closed. Events are being cancelled, for lack of bomb shelters. Rockets arrive from Gaza randomly, but frequently. Many pictures and videos show people running for cover and watching for the rockets. Here you can see a wedding interrupted by rocket fire. #10- What about ‘proportionate response’? There have been cries for proportionate response as a result of the number of casualties being so much higher on the Gazan side. It is difficult to tell what people mean by this. If by proportionate, they mean that every time Hamas fires a rocket in Israeli residential areas, Israel should do the same, a one- for- one- ratio, then I must denounce this call for civilian bloodshed. If by proportionate they mean that we should be killing Israelis for every casualty in Gaza, then I again condemn this call for death. If they mean that Hamas should protect its citizens by fighting the IDF away from residential areas, then I wholeheartedly agree. If they mean that Hamas should open the tunnels they have dug to commit terror and allow residents to shelter there when evacuating the places they fire from, then again, I agree. #11- What are these tunnels I’m hearing about? 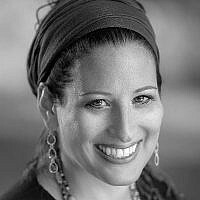 Is Hamas really a threat to Israel or is Israel just overreacting? 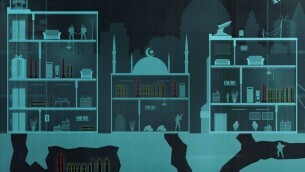 Hamas has dug dozens of tunnels under the Gazan border and into Israel. They are sophisticated, strong, numerous and have been used to attack Israel and for attempts to commit massacres on Israeli towns and cities. Numerous soldiers have been killed by terrorists using the tunnels to burrow into Israel in the last few days. They are the main reason Israel had to put its soldiers at great risk and enter gaza. The threats to our civilians from these tunnels were imminent and great. Hamas has every intention of killing as many israelis as possible. 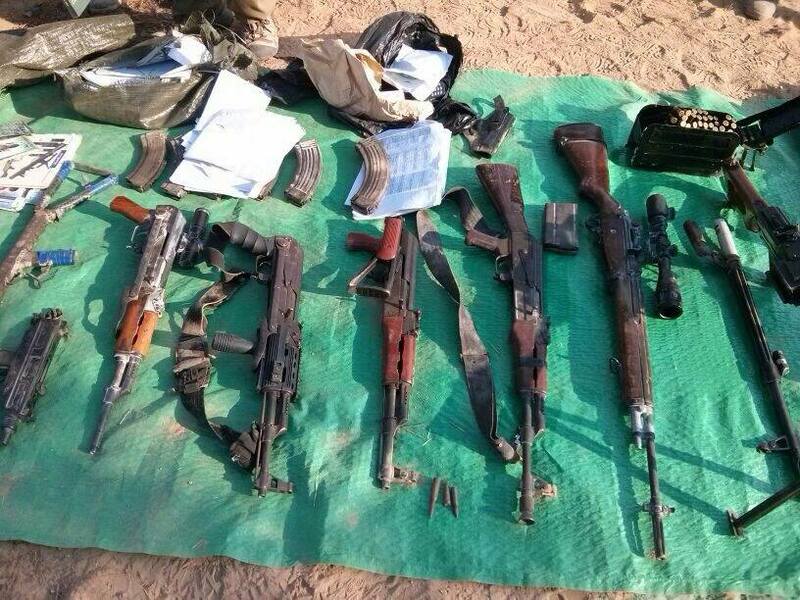 Here are pictures and a video from the IDF. The IDF told the neighborhood to evacuate so they could root out tunnels. Hamas told them to stay. In addition, Hamas has sent terrorists by sea to attack Israeli civilians. You can see them here. You can also see the IDF call off an air strike due to civilians in the area. 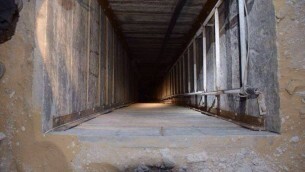 #12- Where did Hamas get the money and materials to build these tunnels? From you. Over the years, international bodies and foreign governments have given billions of dollars in cash and aid to build Gaza. It was to be a Riviera on the Mediterranean with trade, luxury hotels, world class accommodations and a high standard of living. Entire industries (horticulture, agriculture) were left for them to take over when the Jews were expelled. Over $14M was set aside for this purpose. This infrastructure was destroyed immediately. To the great detriment of the Gazan people, their leadership has chosen to steal the money and supplies provided them by the international community (Israel included) and build underground infrastructure to kill israelis instead of neighborhoods, institutions, metropolises and industry to provide them a present and a future. 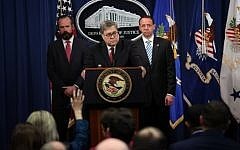 The material and cash they used to build the 34 tunnels found so far could have been used for 10,000 living units, tens of schools, public buildings like libraries and parks. This is the reason that there is no hope for a future for Gaza until Hamas is gone. #13 – What can I do to help? Be aware. Be educated. Tell others. Every casualty- Israeli AND Gazan is on the hands of Hamas. They refuse to stop the rocket fire and they are deliberately trying to provoke Israel into a ground war. You can follow the news here, on Facebook, on blogs, via the IDF or The Muqata. You can download the Code Red app that will let you know every time rockets are fired from Gaza, though I imagine you will soon want to delete it. DO NOT post locations of rocket strikes! Terrorist sympathizers and supporters will use the information to help the rocket squads aim at population centers! Don’t help them. Understand that without Hamas renouncing violence, acknowledging Israel’s right to exist and the Palestinian people’s right to have not only a future but also a present, this ongoing conflict will not end.